In a pan on the stove cook the Italian Sausage. Add this to your crockpot, grease and all. Wash your Potatoes, cut in half, then in 1/4 inch slices. Add to your crockpot. Dice the onion and garlic. Add to your crockpot. 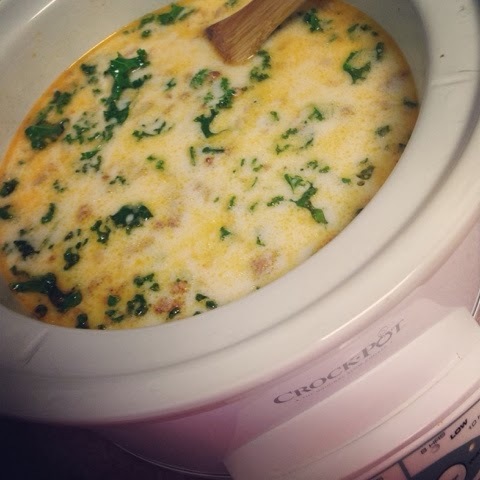 Add bacon bits, chicken broth, and water to crockpot. Before serving wash your kale, and rip the sides off (the ruffled part as I like to call it) and tear it into little pieces. When you have the 2 Cups add this to your crockpot along with the whipping cream. When it is heated thru it is ready to serve. I hope you enjoy! It is one of our favorites.